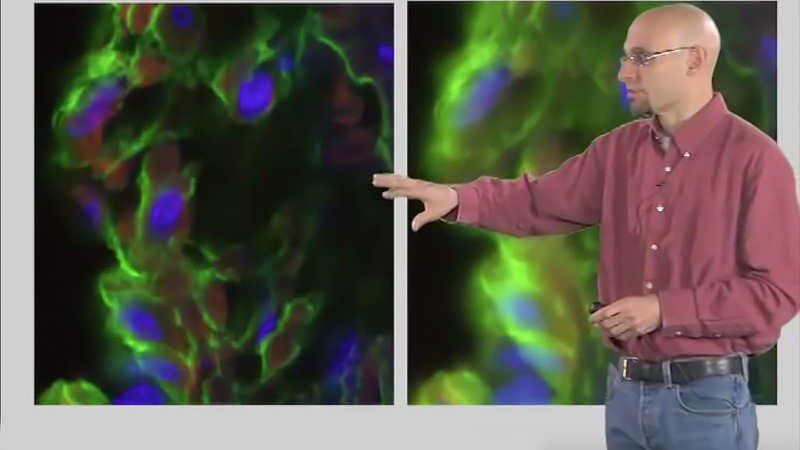 In this lecture about fluorescent probes, Timothy Mitchison describes the chemical properties of organic dyes and quantum dots (Q dots) that make them fluoresce and how their fluorescence wavelength is tuned. It also describes how dyes can be attached to proteins, photobleaching, and other dyes that bind DNA (Hoechst) or organelles (mitotracker, lysotracker). True or False: A larger extended orbital of a fluorescent dye will result in a bluer shift of fluorescence. Which of the following is true of fluorescence dyes? Labeling a protein with a single Qdot is significantly easier than with fluorescent dyes. An excited fluorophore can pass energy to molecular oxygen to produce which two damaging reactive species? The technique CALI stands for ______________________ . What are the two most common amino acids used for covalently attaching fluorophores in proteins? Which one is the most common? Name a common reactive group for labeling lysine residues? Which pH is most suitable for labeling- pH 6 or pH 8? SNAP, HALO and FLaSH are genetically encoded tags for covalent reaction with a fluorescent dye. Which is the smallest?